For instance, here's one word: Disturbing. 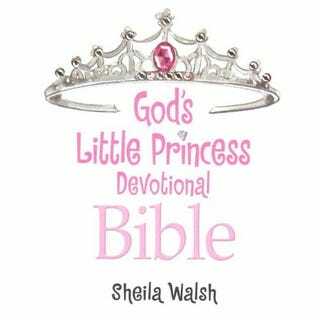 The characteristics focused on in this Bible storybook will help your little girl blossom into the princess she was created to be. Virtues to create beauty such as compassion, sharing, and truth are highlighted in fun and engaging ways. The perfect format for girls to learn about their destiny as a daughter of their King. The princess meme has become so dominant and saturated every aspect of pop culture that it's now being used to teach religion. A gender-neutral bible is not good enough; little girls need a one with pink accents and a tiny tiara. In addition, you can argue that boys "long to be loved and adored" just as much as girls do, only we live in a society that places more emphasis on girls being pretty and popular. (Of course, you can also argue that some girls do not long to be loved and adored, but would prefer to be left alone and not fussed over.) As for giving their hearts to their heroes? That's not something inherent to girls, either. Boys "give their heart" to baseball players, rock stars and other notable figures, it's just not coated with the sugary, dreamy language stereotypically used on girls. One Amazon.com customer writes, "What little girl doesn't want to be a princess?" The answer: Plenty. Some want to be gymnasts, scientists, actresses, soldiers, librarians. Furthermore, regardless of the religious message, teaching a girl to be a "daughter of a King" is troubling as it means that the little girl's identity is fully linked with that of someone else. In this case, the King is God, but all princesses have this problem: A princess is a daughter, a wife or an heir — not an individual. She defines herself by who she in relation to another. Plus, while a warrior goes out on adventures and experiences the world, a princess usually stays in her castle — a point driven home in the New Super Mario Bros. game for Wii (which we mentioned earlier) in which Princess Peach has been kidnapped and must be rescued. Again. Just like God created little girls in a special way, He created little boys to be mighty warriors… even when they feel small. Now with this new devotional Bible in storybook format, boys can learn how to be strong, honorable, courageous and true. Selections of Bible text from the International Children's Bible are combined with delightful articles to help a budding warrior earn his armor. Do girls not need to learn to be strong, honorable and true? Are a little girls not allowed to be budding warriors? Are there compassion and sharing lessons for boys, or is that just girl stuff? These books further the notion that girls are delicate, fragile, dreamy creatures in need of protection — or at least Purity Balls. Unlike "warrior" boys, strength and independence are not something for girls to focus on — instead, "beauty" and caring are highlighted. Luckily, Amazon notes of God's Little Princess Devotional Bible: "This is a bargain book and quantities are limited." Hopefully, most girls out there won't get the message.